BEGIN TRANSCRIPT – RUSH: We have gone live on our Facebook page and the web link is Facebook.com/RushLimbaugh. We’ve got 20 wedding pictures that have been posted at our page. As I said yesterday, we have a little sweepstakes going on. Did you click on the sweepstakes button, Snerdley? What do you mean you’re not eligible? You can click on it and look at it even if you’re not eligible. I clicked on it and looked at it and I’m not eligible because I’m the one giving them away. We are giving away a 64-gigabyte 3G iPad, Wi-Fi 3G iPad every Monday, Wednesday, and Friday from today through August 30th. Now, these are not ordinary iPads. They are custom engraved on the back with my signature and the EIB logo. They can be purchased or obtained nowhere else but this contest on our new Facebook page. That means we are giving the first one away today. We’re going to select the first winner late tonight from among today’s entrants. Now, the 64-gig 3G iPad is the top of the line, 3G in case you don’t have a Wi-Fi hot spot to connect to. But you don’t have to connect to 3G. I mean that’s dollars. You gotta sign up with AT&T. It’s a monthly thing, it’s not a contract. But you don’t have to. So we’re not giving away something that must cost you money. It’s optional if you want to sign up for 3G service and the iPad. It’s Wi-Fi ready, everywhere, the largest drive that is made. Now, to be entered you have to go to Facebook.com/RushLimbaugh and look for the sweepstakes tab at the top of the page, you click on that and enter your information. The contest will also require that you press the “like” button on the page to enter. You don’t have to, but if you want to enter the sweepstakes you have to hit the “like” button. It’s a small gray box at the top of the sweepstakes entry page. You only need to enter one time and you’re in it for the chance to win any of the nine iPads that we are giving away. 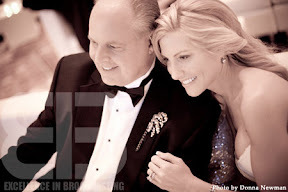 If you check the “I want to receive information from Rush Limbaugh” box when you enter, we’ll sign you up to receive the Rush in a Hurry daily e-mail that appears in your inbox about an hour after the show each busy broadcast day. Rush in a Hurry is cool. Rush in a Hurry is the immediate summary including some links to audio and video that we have used on the program that day. It will give you a hint as to what the full website update is going to look like when we finish between five and six p.m. Eastern every day. Rush in a Hurry is an el freebo thing. You sign up for that. It’s a daily e-mail. It comes to you in either text or html format, however you want it to come. After you do all that, you can click on the photos tab to see the wedding pictures. You can also click on the wall tab to keep up with the breaking EIB news as it emerges. The wall tabs are where we will post things now and then and you’ll want to check back often purely to assure yourself of having missed nothing. So the address is Facebook.com/RushLimbaugh. We went live at about 10:30, 11 o’clock this morning, and it’s already the number five most trafficked site in all of the Internet. It’s probably higher than that now since I’ve given this first shout-out. So the wedding pictures are there, there’s 20 of them, and I don’t know, we might add some more. There aren’t any of the guests because we haven’t sought permission from the guests, you know, this thing was a private affair. We decided to put these pictures up, originally we didn’t intend to do any of this, but there’s been such a clamor and frankly the pictures are such works of art that after we saw them, Kathryn and I, we wanted some of these things to be seen, so that’s why we’ve created the Facebook page for you to see the wedding pics. We might put some more up in the course of time, I don’t know if we will or not, but there’s some of Elton John and the performance after the wedding, some of the ceremony. There’s a picture of me and Snerdley. People are always wanting to know what Snerdley looks like, so there’s a picture of Snerdley and me that’s there. There’s 7,000 of these pictures from both nights of the weekend of revelry. (interruption) What? Oh, the first picture of Kathryn? Yeah, all these pictures are works of art. That picture of me and Kathryn is either during the Elton John concert or right before it. But we’re sitting in the ballroom where that took place. At the Breakers is where it was. RUSH: By the way, Snerdley, would you like to hear something interesting? I’ve had some people checking this out. Your photo has more comments on my Facebook page than any photo except the opening photo, the one of me and Kathryn. The picture of me and Snerdley on the Facebook page is getting more comments than any other picture except for the opening page. You’re a popular guy. And, you know, some of these comments: “Rush, you better be nice to that guy.” (laughing) I said, “Whoa.” (laughing) “Rush, you better be nice to Snerdley.” You know, even after 22 years, this is the first day for millions of people to learn that you are African-American. Stunningly so, but that’s the conclusion that is inescapable. So you’re a popular figure on the El Rushbo and Kathryn Facebook page, Snerdley, second only to the opening picture of — in fact, you’re getting more comments than Elton John photos are getting. Yes, Snerdley, and — (laughing) — there are 20 pictures up there.